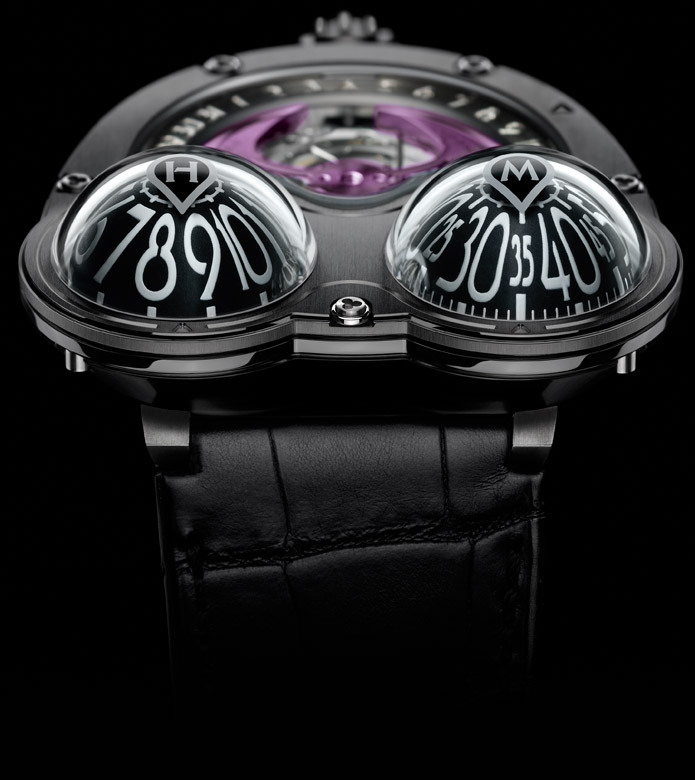 MB&F unveils latest version of its Horological Machine No 3 Frog in a numbered limited edition of just 18 pieces. The new model, HM3 Frog Zr brings some playfulness into high-end watchmaking like its elder brother HM3 Frog. Zr is the chemical symbol for zirconium, a transition metal resembling titanium. Underneath its apparently tough guy zirconium exterior, the flamboyant purple 22K gold rotor animatedly spinning on the dial, reflecting intriguing hints of green and yellow, sends a crystal clear message that the Frog Zr also has a healthy sense of fun. The bulbous domes housing the hours and minutes of the Frog Zr enable the wearer to easily read the time from a wide variety of angles without having to turn the wrist. 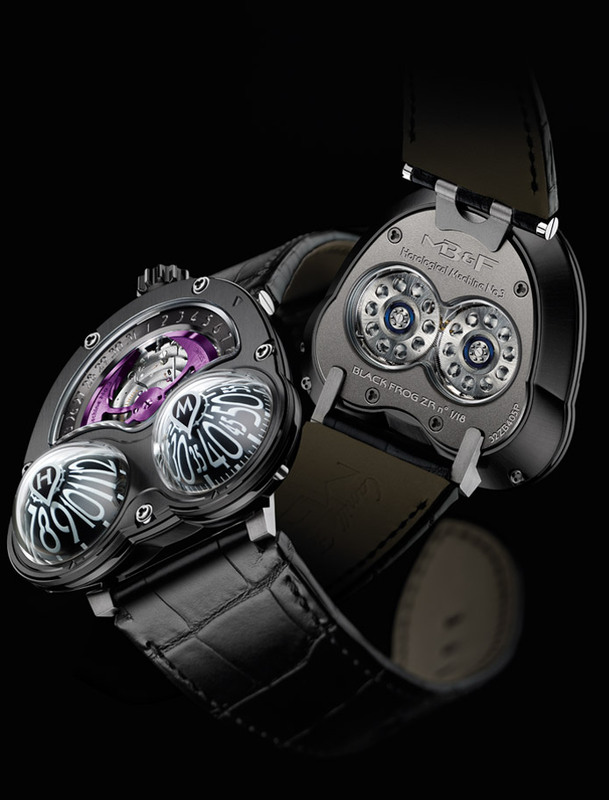 And, as with its brothers, the Frog Zr differs substantially from HM3 in that it is the aluminium domes that rotate under the sapphire crystals in the Frog Zr, whereas the hour and minute hands rotate around stationary cones on HM3. Those hour and minute domes are machined from solid aluminium, chosen for its optimal strength-to-weight ratio, to a thinness of just 0.28mm and they tip the scales at just 0.5g, thus reducing rotational energy requirements to an absolute minimum. The fabrication of the semi-spherical sapphire crystal domes was just as demanding, because the slightest imperfection in the sapphire would introduce a disconcerting magnification effect. The Frog Zr may portray the time in a playful manner, but there is nothing playful about the meticulous attention to detail regarding the fine hand-finishing of the 304 component highly-tuned 36-jewel engine purring within its space-grade zirconium case. It is a case replete with carefully thought-out detailing including clover-head screws, an engraved arrow indicating the easy to read over-sized date and a display back revealing the dual ceramic bearings that drive the domes. 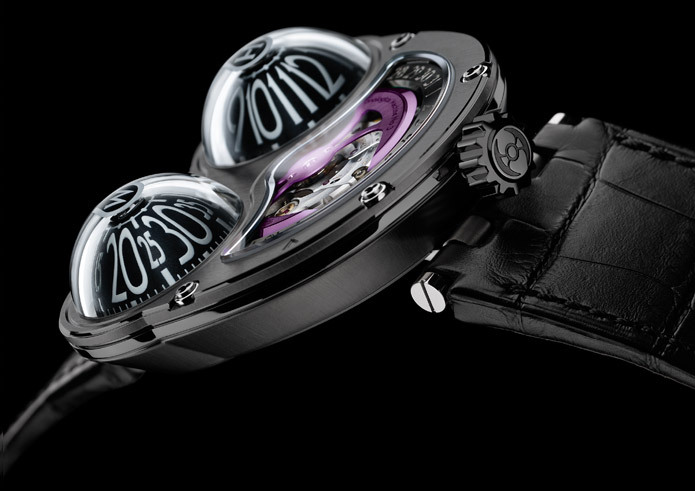 The Frog Zr is a limited edition of 18 pieces in zirconium with a purple 22K gold rotor. Sapphire crystals: Domes and both display backs with anti-reflective treatment on both faces.